Make a mural of the Arctic. All you need is a large sheet of mural paper about 3 feet by 6 feet and paints or crayons. Click on the small pictures to download the full sized artwork, or click on the link below each picture for the PDF version. Then color, cut out the images and paste to the mural. Print as many copies as you wish. ~ A long shore line can be created by linking floe ice pages. ~ Leave a section of your mural for underwater scenes. Using a white pencil, chalk, or jell pen, students can draw the submerged portions of icebergs, the underwater caves and channels will create a fascinating landscape. ~ By enlarging or reducing an image you can create the illusion of vast distances. ~ Use mirror on your copier to double the images of the animals. on a white background) with a few straight cuts. ~ Create details by showing animals tracks, human tracks, and sled tracks. ~ Many Arctic animals are white. This is a great opportunity to teach shading. A shadow under each animal will give a realistic representation of land. Hints: To make the perspective of your mural put the smallest animals in front. An igloo is made of snow blocks sawed out of the snow. They are not placed layer upon layer, but in a continuous circular line like a snail. Much of the igloo is below the snow porch or entrance which can be blocked off with an animal hide. The Igloo is much bigger than it appears from the outside. 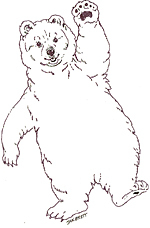 To color your polar bear shade with light gray around the edges of his shape so he appears to be rounded. Polar bears have a yellowish tint against the white snow so you can use a very pale yellow on his body. The largest male polar bear was measured at eleven feet. Considered a marine mammal the polar bear is at home in frigid Arctic ocean, kept warm by a layer of fat called blubber. Polar bears swim long distances, but can be found hunting for seals along the floe edge where the frozen se ice meet the open ocean. You can see evidence of the polar bear's black skin around its eyes, nose, and the pads of its feet and its tongue. Papa Bear's parka goes straight across on the bottom and his hood is smaller and pointed. Color his parka grayish brown. His waterproof Kamiit boots) are dark gray black on the bottom. Men's and boys Kamiit have a vertical or up and down decoration. Polar bear's fur is not white, but clear. Each hair is hollow and funnels the sun's warmth into its black skin. Black absorbs light well. Of course, about the Arctic circle where polar bears live, the sun doesn't appear about the horizon in winter. Mama bear's parka dips down in the front and back, making it recognizable as a woman's garment. Her large hood, called an amauti can be used like a backpack. Her boots are fancy, and would be worn at ceremonial dances and festivals. The are called Kamiit. Baby polar bears are the size of a guinea pig when they are born in the snow den the mother bear has made. Sometimes she has twins. In nature, the father bear is not involved in bringing up the cubs. 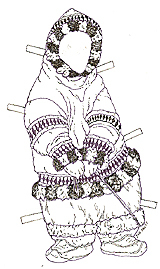 Baby Bear's parka dips down in the front and back showing that it is worn by a woman or girl. Her parka is a fancy one, worn on special occasions. The fur on the main part of her parka is ground squirrel. Color it reddish brown with white spots. 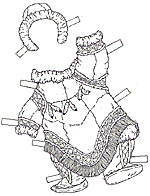 Baby bear's hood or amauti is attached to her parka. It hangs down in the back when not in use. You can decide if you want to show baby bear with her amauti up or down. The flat ice pieces are called pans. They are part of the sea ice which is frozen ocean water. It is salty. The top is white, below is pale blue green. The surrounding ocean is deep blue green. The circular hole in the sea ice is a seal's breathing hole. You could place a seal on the ice near it. Sometimes a polar bear crouches beside the breathing hoe waiting for the seal to appear. The seal is a favorite food of the polar bear. The walrus, a male or bull color and brown gray. This is a very large mammal. It can be 12' long. Its tusks can grow to 3'. Its hair is sparse, although the male has long thick whiskers. It eats clams which it digs up with its tusks, but it also eats seabirds and seals. Walrus are dangerous and will attack boats. The ringed seal is one of the smaller seals, about 5'3 long. They carve deep breathing holes in the ice with their teeth. The pelage of coat of this seal is dark gray with a pale underside. The light rings are scattered throughout the dark area. The female hooded seal is the only seal with a distinctive blotched coat or pelage. The female is grown at 7'10". Her pup is nursed for only four days, and then it is on its own, the shortest period for any mammal. The female is creamy white with black blotches. The harp seal male and female have black heads and a black saddle shaped area on their backs. 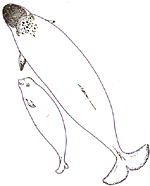 The harp seal is smaller than the hooded seal. The seal grows to be six feet three inches and the female five feet eleven inches. Newborns are pure white and stay with their mothers for two weeks. Use your pencil to shade the black and white seals. Holding you pencil on its side go all around the outline of the seals shape, about 1/4 of an ince. Go around a second time to about one eight of an inch. Your seal should take on a rounded shape. When a seal or walrus comes up onto the ice it is said to be hauled out. Both male and females have tusks. The male narwhal is 14' to 15' feet long. The male has a long spiral tusk, the female does not. The narwhal's enemies besides man are killer whales and polar bears. It eats fish and shrimp but does not spear fish with its tusk. Use shading to color the white male narwhal and mix pale yellow and beige to color the tusk. A woman's knife called a Ulu. A teakettle for brewing Labrador tea. The female is one foot smaller than the male, but is larger in the drawing. Her coloring is not finished, I am leaving it up to you. She has small black spots and speckles down the middle of her back. There are fewer spots on her sides. This view is from above, so her elegant flukes are seen. The calf is medium gray, with no spots. Baffin island, the fifth largest island on earth borders Greenland, with Baffin Bay between, on the east. Tall tress do not survive because the ground is permanently frozen. Trees, such as the willow, have adapted by growing along the ground. Melt water from glaciers and midnight sun during June make the short growing season, about five weeks exceptionally beautiful. Deep fjord, channels that cut in from the shoreline, and high granite peaks are characteristic, as well as huge freshwater lakes. Not far from the polar bear you will find the arctic fox. When a polar bear kills a seal it eats the blubber leaving the meat behind. When the bear is finished, the arctic fox moves in to eat his share. Arctic fox is a furrier more compact fox because it has to survive in extreme cold. 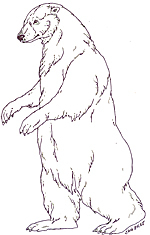 Color the arctic fox by shading, since its coat is white. One of clothes for the arctic fox is a parka with an amauti or hood. At the arts center in Pangnirtung, a town in Baffin Island, some of the Inuit art pictured wild animals in traditional Inuit clothes. Color the main body of the parker gray or brown. The trim is duffle, a sturdy clot and could be any bright color. 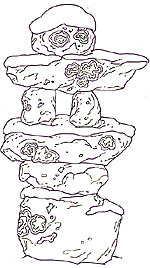 In an Inuksuk, or traditional store marker, the rocks are shades of gray and brown but the lichens, which are slow growing plants that grow in cold environment are pale green (the round ones) and bright orange and brown (the spotty ones). An inuksuk points the way to an important place and is sometimes bult to look like a stone person! A komatik or sled. The box in from caries supplies. Extra furs and seals from the hunt are covered over to make seats. Each dog is attached to a center piece in a fan shape by colored lines. Each one is a different color. The center piece is attached to the komatik on each side. 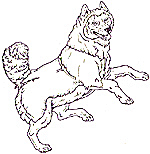 The Greenland Inuit dog is of the husky dog type, a working breed. It is unusual because it has remained pure for thousands of years. It is as hardy as an Arctic wolf, but is playful and gentle when handled properly. Today's sled dogs have been replaced by snow machine for pulling a komatik or sled. But nothing can replace the canny, resourceful sled dog for safety on the ice. On Baffin Island, the team of Greenland Inuit sled dogs was owned and trained by Arctic expedition leader, Mattie McNair. Louis-Philip Pothier was the musher for our trip. He drove them and helped with the dog's training and conditioning. In treeless areas sled dogs are attached to the Komatik or sled by a fan hitch. Each don't pulling line is a different color. The lead dog is first and he or she obeys the voice commands of the musher or driver.